The dentists listed below are members of my International Association of Mercury Safe Dentists (IAMSD) and practice mercury free and mercury safe dentistry. Because they practice mercury free and mercury safe dentistry I consider them to be holistic dentists. If any of the links below aren't active please Click Here and select the State or Country of a Mercury Safe, Holisitc Dentist. Sorry, no mercury free dentists listed in South Dakato at this time. Sorry, no mercury free dentist are listed in West Virginia at this time. Sorry, No Dentists Listed at this time. Clicking on each Mercury Free Dentist's name will provide Key Information about who they are and the treatment options they offer. Mercury free dentists listed in each Province, or country, are arranged alphabetically by city. Sorry, no dentists listed in Aruba at this time. Sorry, none listed at this time. Sorry, no mercury safe dentists listed in England at this time. Sorry, no mercury free, mercury safe, dentists listed at this time. The term Mercury Free Dentist is commonly used to indicate dentists who practice Mercury Free Dentistry. But technically dentists who refer to themselves as just Mercury Free (amalgam free) are not actually Mercury Free. The fact is that dentists who say they are only mercury free are still removing mercury amalgam (silver) fillings, even if they aren't putting these toxic fillings into the teeth of their patients. That means that their offices aren't really mercury free. Yet the phrase Mercury Free Dentist, or Mercury Free Dentistry, has caught on and may be here to stay. Thus, when people that become aware of the fact that mercury amalgam fillings consistently release highly poisonous mercury vapor and want to find a dentist who will safely remove these fillings . . . they are conditioned to search for Mercury Free Dentists. What they are really looking for someone who is not just amalgam free but also a Mercury Safe Dentist! This is a dentist who states that he or she practices Mercury Free (amalgam free) Dentistry but what they actually mean is that they practice Mercury Safe Dentistry. The true definition of Mercury Safe Dentistry is that the dentist will do everything he or she feels is necessary to minimize your exposure to mercury vapor when they remove your mercury amalgam (silver) fillings. Thus, when you find a dentist who advertises him or herself as being mercury free you want to also make sure that they are mercury safe. 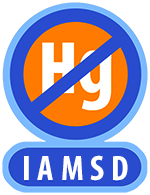 Click Here to find a list of Dentists who are mercury free (amalgam free) and mercury safe. There is no set standard for safely removing mercury amalgam (silver) fillings, but the concept is pretty much agreed upon. The dentist will do as much as can be done to minimize the amount of mercury vapor that is released from an amalgam filling when it is being removed. Basically this involves cooling the filling with water, sectioning it out in chunks to minimizing excessive drilling that can heat the filling, and using a good suction/evacuation system. These three procedures are very effective and will reduce the amount of mercury vapor significantly. The second part of the safe removal of amalgam fillings involves protecting you from the mercury vapor that is not captured near the amalgam filling. Primarily this involves providing you with an alternative source of air to breathe during the actual removal of the mercury amalgam filling and the utilization of a rubber dam to protect you against against swallowing amalgam and tooth particles. I should mention that the most commonly used rubber dam is made out of latex rubber and it will allow some mercury vapor to pass through it if you breathe through your mouth during the amalgam removal process. I always recommend that you concentrate on breathing through your nose (nostrils) during the actual removal of your amalgam fillings. I suggest this because a high percentage of people are anxious when in the dental chair and will tend to breathe through their mouths. More detailed information about the safe removal of mercury amalgam fillings can be found by Clicking Here. The best way to find a dentist who is both amalgam free and mercury safe is to use my Mercury Safe Dentist list. The amalgam free dentists who list with my Mercury Safe Dentist Internet Listing Service have committed to remove amalgam silver fillings in a safe way. Every member dentist also provides information about the services they provide and you can use that information to select the mercury free dentist that best fits your needs. Click Here to access the Mercury Safe Dentist Search Page. To find a mercury free and mercury safe dentist in the USA simply Click Here and under USA Dentists, select the state you are looking for a dentist. The mercury free and safe dentists that are listed first belong to my International Association of Mercury Free Dentists and will have a orange IAMFD logo next to their name. I highly recommend that you choose one of those listed. To find a mercury free and mercury safe dentist in Canada simply Click Here and under Canadian Dentists, select the province you are looking for a dentist. The mercury free and safe dentists that are listed first belong to my International Association of Mercury Free Dentists and will have a orange IAMFD logo next to their name. I highly recommend that you choose one of those listed. To find a mercury free and mercury safe dentist Internationally, simply Click Here and under International Dentists, select the country you are looking for a dentist. The mercury free and safe dentists that are listed first belong to my International Association of Mercury Free Dentists and will have a orange IAMFD logo next to their name. I highly recommend that you choose one of those listed. Click Here to Find a Mercury Free, Mercury Safe, Amalgam Free, Holistic Dentist in the United States, Canadian Province, or Country. Oral health plays a significant role in overall, general, health and your cannot be healthy without healthy gums and teeth. But there is more to oral health than just the gums and teeth. Mercury amalgam (silver) fillings can contribute to chronic mercury poisoning and cause mercury to accumulate in your body. Mercury is one of the most poisonous non-radioactive substances on our planet and even one atom of it is harmful. Mercury can directly, or indirectly, cause, contribute, or make worse every health problem you are dealing with. mercury from amalgam, silver, fillings causes autism, learning and developmental disorders. The key to dealing with chronic mercury poisoning from amalgam fillings is to have these fillings safely removed by a mercury free and safe dentist and participate in a safe, effective and natural mercury detoxification program. I have provided a list of mercury free dentists in the United States, Canada and Internationally below. Do find a dentist who practices mercury free dentistry click on the link. Click Here to read excerpts from Dr. Tom McGuire's new book, Mercury Detoxification: The Natural Way to Remove Mercury from Your Body. To learn more about Dr. Tom McGuire's Mercury Detoxification Program and how chronic mercury poisoning effects your health Click Here.